Gene Pritsker is a remarkable contemporary composer. 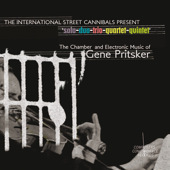 His short repertoire, represented on Solo-Duo-Trio-Quartet-Quintet: The Chamber and Electronic Music of Gene Pritsker (Composers Concordance Records, 2011) testifies to this fact. He has an acute sense of his own place in the history of music and this is marked by the contemporariness of his work, that is derived from an association with Darius Milhaud. He is inspired to delve into dissonance by composers such as Paul Hindemith, with whom he enjoys more than a "passing musical relationship." He is a wonderful manipulator of custom electronics, and for this he owes as much to Olivier Messiaen as he does Edgard Varèse, Karlheinz Stockhausen as well as Iannis Xenakis and Pierre Boulez. He also doffs the proverbial hat to holy minimalism adopted by men like Henryk Górecki and Arvo Pärt. Yet he is a singular voice, who is long past experimenting with devices and forms, all of which melt away in his compositions that are usually eminently accessible, yet can sometimes be very difficult to approach even though they are short. This is because he is very philosophical, owing much to the mysticism and pragmatism of the 19th/early 20th American philosopher, William James. But there is another remarkable aspect to his music. He is can be extremely lyrical and is quite capable of expressing himself in words being an agile rapper as well. Although this facet is not represented on this album, his great facility with epic poetry is. The manner in which he wraps music around the Chinook blessing on "We Call Upon The Earth" is typically beautiful. Of course, Charles Coleman's silken baritone has much to do with the delivery of the poem, but it is Pritsker who makes it all work in his brooding composition, performed here by the Sweet Plantain Quartet, who accompanies Coleman on this adventure. His mystic sensibility is wonderfully captured by Dan Barrett's brusque cello on "What Occurred In The Light Goes On In The Dark." The dancing lyricism of the poetry of Theodore Roethke comes alive in the sway of "Poem #1." Much excitement is generated by his electronics in the short compositions represented here, especially where folkloric work meets prepared music in "A Tribal Second" and the playful "Sip." The complex side of his work gets its due moment in the spotlight in the majestic four-part suite, "Credit System of Truth," a meandering composition worked around shifting measures of the quarter note, showing Pritsker at his dense best. The work plunges into the world of timbral values with absolute verity. Tonal color is also used here with a great deal of ingenuity and inspiration. The string ensemble, Sweet Plantain Quartethere without the voice of Colemangives a fine account of themselves as they navigate through rapid changes in harmonics and maneuvers expertly in the rhythmic labyrinth as well. This album showcases some of Gene Pritsker's more memorable short works and forms a much-awaited bookend with his longer work, Varieties of Religious Experience Suite (Innova Records, 2010). Track Listing: What Occurred In The Light Goes On In The Dark; A Tribal Second; C17H21NO4; A CaSampella; Poem #1; Inside; Credit System of Truth Part 1: Quarter note = 120; Part 2: Quarter note = 98; Part 3: Quarter note = 60; Part 4: Quarter note = 140; Sip; We Call Upon The Earth; Healing Paradox; In Memory of Giampaolo Bracali. Personnel: Dan Barrett: cello (1, 5, 14); Lynn Bechtold: violin (3); Jennifer DeVore: cello (3); Michiyo Suzuki: bass clarinet (5); Greg Baker: guitar (5); Sweet Plantain Quartet: Eddie Venegas: violin (7-10, 12); Romulo Benavides: violin (7-10, 12); Orlando Wells: viola (7-10, 12); David Gotay: cello (7-10, 12); Charles Coleman: vocal (12).